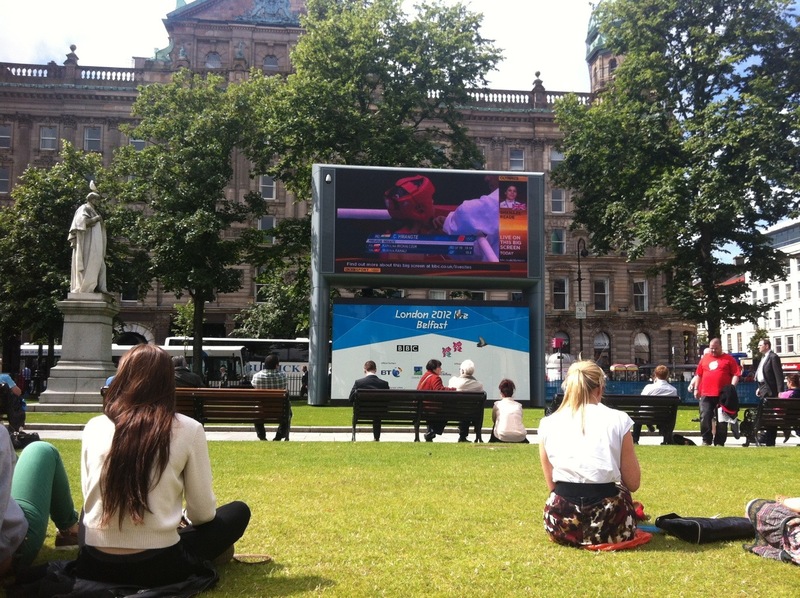 Watching the Olympics outdoors in Belfast on a sunny day. Something of a surreal experience. Much to my surprise, I’ve found myself really enjoying the London Olympics. Having been mired in British cynicism ever since London won the bid many years ago, I guessed that this would be, at best, a mediocre games. Well, I’m glad to say that I was wrong. From the torch run that visited Ireland on the way to criss-crossing the U.K. to Danny Boyle’s spectacular, whimsical and multicultural opening ceremony, the build-up was pitch perfect: positive without being pompous or pretentious. Amazingly, the games themselves took that solid start and ran with it, converting even the most ardent sceptics. The success that British Olympians have enjoyed in the past two weeks has helped a lot. I’ve been flicking between BBC and RTE for my coverage, and while the former’s constant mood of celebration has occasioned eye-rolling at times, there have been some spectacular moments at times, and the flood of golds have undoubtedly added to the party mood in London. Having considered going last year, I decided against it. A bad move, it seems. Every report I’ve heard has suggested that there’s been no better place to be this summer. RTE has had a tougher time with its coverage – not having the resources of the BBC, it has more or less devoted one of its channels and much of its Internet resources to covering the massive array of events. The start of the games wasn’t easy for RTE either, with one Irish Olympian after another seeing their hopes of a medal slipping away before the final moments of their events. Thankfully, things seem to have come good at last, with the boxing team, led by the amazing Katie Taylor, now on course to take home a fistful of medals, together with a surprise bronze in the individual showjumping. As for myself, despite the fact that I sit at two removes from any sense of Britishness (growing up in a Catholic, nationalist family in Northern Ireland, and living the most recent half of my life in Dublin), I love the fact that this Olympics is so close to home. The BBC has a lot to do with that: it was responsible for at least half of my cultural education, and I tend to prefer watching the Olympics on the BBC rather than RTE, for at least two reasons: no advertisments and a multiplicity of channels, meaning I can watch what I want, when I want. I can live with the BBC presenters’ over-the-top praise of their athletes as they get swept up in Olympic fever, but when the time comes for coverage of Irish athletes, I’ll turn to RTE for all the details. If nothing else, there are gems in the RTE coverage too. Such as the wildly enthusiastic commentary on the basketball and Jimmy Magee dissolving into raptures every time an Irish boxer lands a punch or two. And when Katie Taylor and the rest of those who have trained for all of their lives for this moment get their just rewards, it won’t matter where my own heritage comes from: I’ll be cheering along with the rest.